The Agile approach is an alternative to traditional ways of project management, and helps teams respond to unpredictability and change through incremental, iterative work sprints and observed feedback. The Agile approach proposes an alternative to the traditional Waterfall and sequential method of software development. Back in the early 1970’s, Dr. Winston Royce published a paper entitled “Managing the Development of Large Software Systems”, criticising the sequential approach to software development. Dr. Royce’s basic assertion was that software should not be developed in the same fashion as a car assembly line, in which each piece is added in sequential phases, and every phase of the car build must be completed before the next phase can begin. Dr. Royce recommended against the sequential approach in which software developers first gather all of a project’s requirements, then complete all of its architecture and design, then write all of the code, and so on. 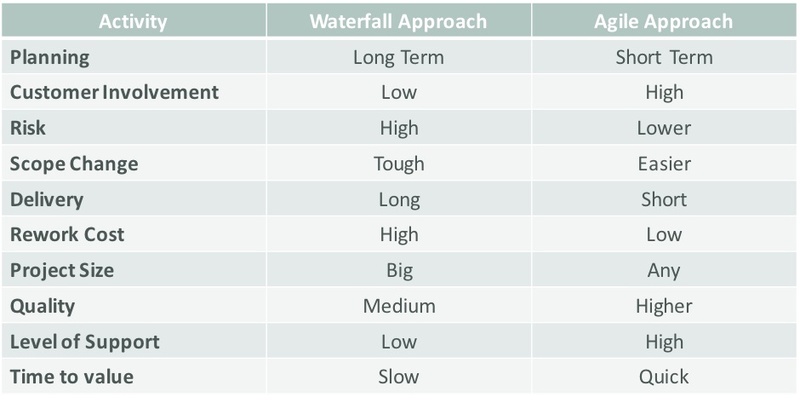 The traditional Waterfall model is a sequential and non-iterative design process, in which progress is seen as flowing steadily downwards - like a Waterfall! It is worth stressing to start with what Agile isn’t – a methodology. So what is it? Focuses on frequent delivery of high-quality working software in the form of business-valued functionality. Near real-time information to tightly manage cost, time and scope. Reduces complexity by breaking down the many months long cycle to small, usable segments of the software development. Developments are specified, built and tested in manageable 2-4 week cycles, referred to as Sprints. So why Agile for SAP IBP? Would the initial Design phase be suited to an Agile approach? Probably not. But! Do remember that even from the start, the business should act as product owners to continually steer development and configuration. The product owner then gets to observe and test what’s been built in early sprints, avoiding the traditional waterfall trap of only seeing visibility of deliverables in final project testing. To stress that it is worth investing time and resource (especially from the business) at the start of any SAP IBP project to ensure that the building blocks to be put in place will support a future Agile development approach. Most businesses will be migrating from an existing Advanced Planning & Scheduling (APS) system. Why not go-live with existing functionality and scope as a migration, and then evolve the SAP IBP solution over a period of Agile sprints? Pick the most important objects that require configuration that will give you speed to business value, e.g. financialisation (a word we use at Olivehorse that you won’t see in a dictionary!) of the forecast or scenario planning. Having the ability to deploy a financialised key figure to reflect the value of the volume forecast is a massive win for most businesses. Most (all?) users download information from APS systems to manipulate the plans in offline spreadsheets. Presenting the data in MS Excel (a tool which they are already familiar with) and in a format (i.e. time bucket column and key figure row data view layout) that has been used for years means very little training is required for end users. Let the users get used to the system first. Gone are the days of requesting large IT teams to build and transport new data views or layout changes. Key business personnel are able to create new templates within hours for use across the business. You will be getting a push based upgrade to your SAP IBP software every quarter (currently). Period. Planning enhancements and developments to dovetail with this timetable and gain business value also favours an Agile approach. Every business is different, but we would advocate to all of our SAP IBP customers that they look at developing their SAP IBP solution in an Agile way, and we at Olivehorse develop our own internal SAP IBP system in an Agile way which through continual feedback and better manageable durations has seen real benefit in the enhancements we have delivered internally. I hope this has been a useful read, and please keep an eye out for further blogs on Agile and IBP!